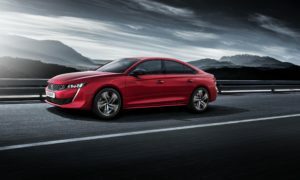 The Geneva Motor Show will see Peugeot reveal its all-new 508, sporting what the company describes as a radical new aerodynamic design. It “combines a bold new low coupé design with the enhanced practicality of five doors”. There is an integrated rear hatch, offering a significantly larger aperture to the 487-litre boot whilst carrying all the hallmark features of the latest Peugeot vehicles, including the full LED ‘claw-effect’ rear lights.rs. Inside, it contains the three main characteristics of the Peugeot i-Cockpit, including the compact, full grain leather trimmed steering wheel, a large 10-inch capacitive touchscreen angled towards the driver and a 12.3-inch head-up digital instrument panel. It also features i-Cockpit Amplify, which enables the driver to choose between two levels of ambience – “Boost” and “Relax”. The new flagship model comes equipped with several driver assistance systems, including a new night vision system, which is new to the segment and uses an infrared camera with the ability to detect pedestrians at night and in cases of reduced visibility.